Give your customer a pager! This will eliminate walkaways and increase revenues right away! Minimize crowds in waiting areas! Increase productivity! Reduce labor costs! 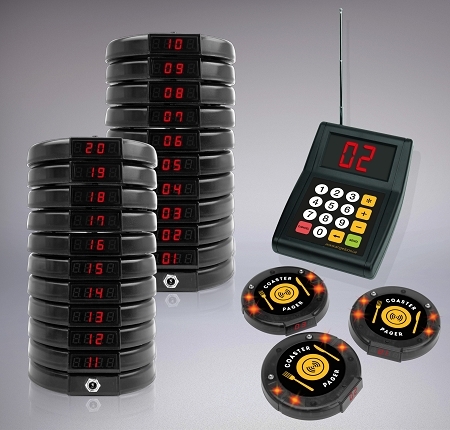 Restaurant Coaster Pager System with multiple Pagers, 1 Transmitter and Charging Dock. It's simple to use! When customers arrive, give them a pager with an ID that will enter into the pager queuing automatically. After getting the pager, customers are free to take a seat or roam nearby. 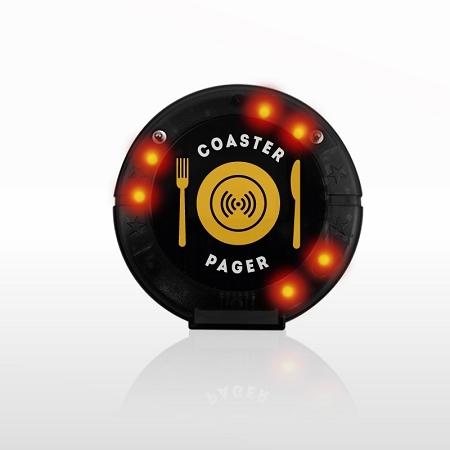 When staff inputs the pager ID into the transmitter, the pager alerts in sound, light and vibration to call the customers back to their meal or queue when it is ready. Guest pagers make great first impressions, by giving guests confidence that they will not get lost in the crowd during rush hours. They are the simplest and most cost effective method to be sure guests are called in a timely manner. The PA noise from repeatedly calling guests is eliminated, and the dining experience is improved. Instead of numerous hosts trying to locate waiting parties, guests are instantly alerted and then return with flashing pagers, so you know exactly who has been paged. With guest paging, patrons feel committed to staying at your restaurant, so there are fewer walk-aways. Table turns are increased, as seating time is reduced, and your revenue is improved. 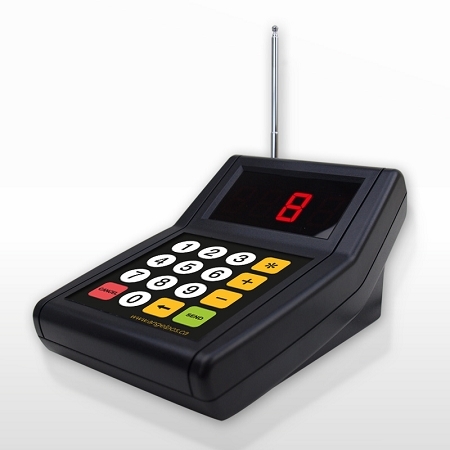 You can always add more pagers to the system as your business grows! We will program the pagers for you. You can just Plug & Play! Give your customer a pager! This will eliminate walk-aways and increase revenues right away! Patient paging in hospitals and clinics. Parent paging in church day care centers. Guest paging at day spas. Customer paging at auto repair centers. Guest paging at golf courses and clubs. Staff paging at factories and offices. Pager can be programmed to switch the display between pager number and current time.